Curly collard and creamy saffron. Not a common combination, but very tasty. When you’re talking about fast & easy, this is a recipe that should be on top of the list. It’s super easy to make. You only need 7 ingredients and it’s on the table within half an hour. Fill a large pot with water, add a lot of salt in it and let it boil. When the water starts to boil ad the Fusilli, and cook until they are al dente. Meanwhile, take two pans and put them on medium heat. Chop curly collard in small pieces and cut the cherry tomatoes in half. Add olive oil in one pan and when it’s hot add the curly collard and cherry tomatoes. In the other pan ad cooking cream, saffron and sundried tomatoes. Prepare the Crispy Tenders according to the instructions on the packaging. 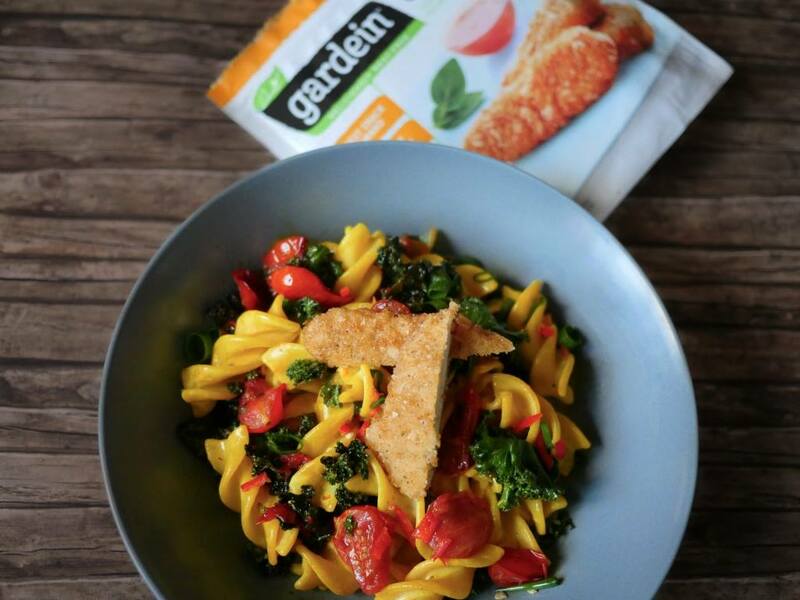 Put some pasta on a plate, put the sauce and vegetables over it, and put some Crispy Tenders on top of it.